The only statement I agree with Sloan on is that it was a brilliant addition to the Constitution — but for only the slave-holding states. James Wilson, a Northerner from Pennsylvania, made a motion to elect the president by a direct popular vote. James Madison, from the South, objected and said it would be unfair because the North had a larger population and would dominate the election of the president. Madison went to work with his brilliant mind and concocted a way the South could use their huge slave population to impact the election of the president and level the playing field. The South had already gained a huge concession from the North in the constitution when the Three-Fifths Clause was created, which allowed the South to count every slave as three-fifths of a person in determining the number of U.S. House representatives would have. In the first census in 1790, it gave the South 59 more Representatives. The Electoral College that James Madison created was for the sole purpose of allowing the South a way to have their slaves and impact the presidential election. The question is why would the North agree to this scheme and dilute their power to elect the president? The answer is very obvious: they had to in order to get enough states to ratify the constitution. Just like they had to agree to support the Three-Fifths Clause, which also reduced their power in the House of Representatives. 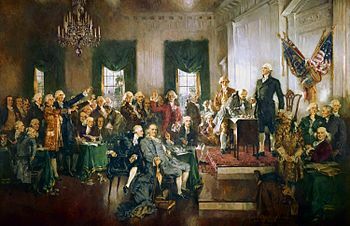 Many compromises were made to gain support for the constitution.The Great Compromise was a compromise between the Virginia Plan which called for a two-house congress, each determined by population, and the New Jersey plan, which proposed a one House legislature based on population. The compromise of a House of Representatives based on population and Senate with two senators passed a constitutional convention committee by only a 5-4 vote. The South won many of the compromises that were made, partly because they came to the convention with plans, and partly because of the impact their leader James Madison had. Mr. Sloan also wrote: “The framers of our constitution did not want a few densely populated areas to choose a national leader.” This comment is pure fiction and the most repeated myth in the justifying of the Electoral College. In 1787, 90 percent of the population lived in rural areas. The size of the states and whether people lived in cities or in rural areas had absolutely nothing to do with the creation of the Electoral College. “We are a republic, not a pure democracy” begs the question what does that have to do with the creation of the Electoral College? The U.S. has elected 40 of 45 presidents by a popular vote. We elect our governors by popular vote, and nearly every other nation in the world elects their leader by popular vote. Even Russia has a popular vote for their leader. He also wrote: “Moving to elect our president solely by popular vote would mean that a handful of liberal states could override the votes from the majority of the country.” What is he talking about? What does he consider the majority of the country? It appears he means the more acres of land a candidate wins. Does he not consider the nearly 10 million people that voted for a candidate other than Trump, the winner chosen by Electoral College in 2016, as maybe a majority of the country? Ironically, the 10 million is the about the same number of Democratic candidates for the U.S. House received in 2018, over their Republican opponents. When slavery was abolished and all exslaves were counted in determining the number of Representatives each state had, the Electoral College became as obsolete as the Three-Fifths Clause. When I first learned manners as a child, I remember something that was a hard and fast rule: You don’t discuss religion or politics in polite society. Having grown up that way, I have always adhered to that strongly held belief. So what I need to know is when did this open political discourse everywhere become OK? I was sick with a migraine last week and went to a doctor for treatment. I was in the exam room with my husband and the doctor walked in and said that he was going to give me a shot to make me better, but only if I was a Republican. If I was a Democrat, he was sending me to Nancy Pelosi’s house. He was kidding. I think. But still, when did that become OK? Have we come to a moment in our history when Democrats are treated differently than Republicans? Some jokes go too far. Some jokes step over the line. So why did this doctor say such a thing? Because he thought that he could get away with it. Trump has created a new religion, furthered by his partners in crime like this doctor. If we were Republicans, we would have laughed at this “joke,” quickly and quietly reversing the entire river of knowledge, good manners, and values that we learned as children. Trump’s salvation show requires a total buy-in to his hallucinogenic spells in which he conjures up new boogeymen on a daily basis in his technicolor dreams. He then appears before the crowd spewing them forth with just the right amount of over-the-top anguish, making his followers believe at once that he is indeed the champion of their cause as the oppressed working class, while simultaneously asking them to believe that he is also the richest person ever. Oh, and really smart. Faith. You must have faith. And it is because of this blind faith and aided by people who really know better, that he gets away with his outlandish behavior. He has gotten away with it all of his life. And apparently, it is because no one has ever told him that it is not OK! We all know that he is all about putting his name on everything. He slaps his name in huge letters on the top of big buildings and golf courses everywhere and claims he built them. Last week when he went to the border to visit the mecca of his delusions – The Wall – he carried a plaque proclaiming that it was “Trump’s Wall” and had it mounted on the FENCE that was built with taxpayer money during the Obama Administration. Was that OK? There is a new book about how much Trump has cheated at golf over the years. As someone who has spent most of my career in that industry and with a husband who has maintained from day one that “If you cheat at golf, you will cheat at everything”, I was intrigued. There is a true story contained in the book about a Trump-owned golf property holding their annual club championship. Trump called to ask who had won. He told them “No. put my name on the top of the plaque as the winner” even though he didn’t play in the tournament and wasn’t even at the property. Say WHAT? When did that become OK? And no one said no? The question is, how are we supposed to teach real values to our children? How can we tell them to play by the rules or even discuss the rules when they see us idolizing someone who so clearly does not? What about manners and good sportsmanship? It has become a general “loosening of the rules” of our entire society. Well, not just a “loosening”. We have totally lost our way. His followers believe that they can do or say anything because they see him get away with it. When did that become OK? The fact is that it is not OK. While lying there sick and asking a Republican doctor to treat me, I reminded him of that. Politics should have never entered the room. No, that was definitely not OK! Support the Lake County Democratic Party and local candidates. Your support is vital and will help us Get Out The Vote, support volunteer efforts, and help support Democratic candidates across our county. Help make a difference! Volunteers are the life blood of the Lake Democrats. We have many volunteer opportunities that can fit your schedual and skill set. Use Mobilize America to sign up for local events and volunteer opportunities. Join us in making a difference today!